The search for the perfect tape measure is no small task. I have yet to find one that I am 100% happy with and have been on a never ending search ever since I started working in construction. For the longest time it seems as though manufacturers were content with tape measures as they were; without even trying to come up with new ideas. Thankfully that has all changed, and the last few years have been full of a lot of really good tape measure ideas. Johnson Level has now entered the tape measure game with a complete line of their own, and I say, the more the merrier. I don't know if Johnson has the tape measure you have been longing for, but they do have a line up that offers a ton of great features. Their top of the line Big J model includes all the features I look for in a great tape, and many more. Big J uses an extra wide 1-3/16 blade that allows for extended standout, has measure markings printed on both sides of the blade, uses a double sided hook, and is all housed in a rubberized stainless steel case. Have you ever seen a tape measure with a stainless steel case? I will be keeping my eye out for the Big J in stores. 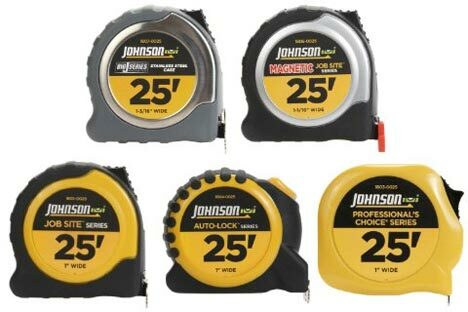 The new Johnson tape measure line has features like auto-locking and magnetic tips, to fit jobs of all types.